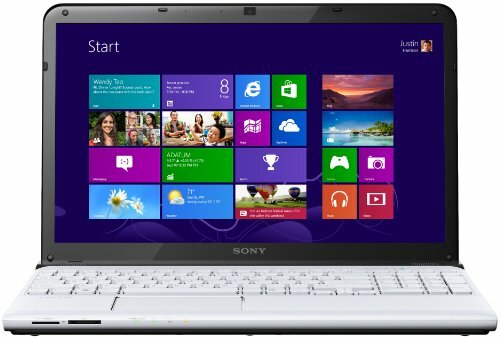 Below is our review of the Sony SVE1512J1EW, a 15" laptop, featuring 4GB RAM, 640GB hard drive and Windows 8. Here we have Sony's latest laptop offering, featuring an Intel i5 2.5GHZ processor and 4GB RAM. Essentially this laptop is the same as the SVE1512J6EW model, but with an upgraded processor, and so a lot of that review will be accurate for this notebook. From the exterior, the laptops are pretty much identical - both feature the same two tone contrasting white and black finish that Sony are renowned for. The lid of the SVE1512J1EW is finished in the traditional pearlescent white, with a central rounded Vaio logo. Conversely the interior features a glossy black trim, with the 15" screen surrounded by a thick black bevel. The keyboard and it's surround are both finished the same white finish as the exterior, which looks smart - long term use may require the odd clean to maintain this sterile pristine look though. The laptop measures 3.5cm in depth, and 37.2cm in width, and as such should be small enough for regular commutes. To the front you'll find card readers, and to the left hand side of the laptop you'll find HDMI, Ethernet, VGA, a USB port and headphone and microphone jacks. To the right hand side you'll find the laptop's DVD drive, as well as 3 more USB ports - so enough options for the majority of users. Storage is catered for by a 640GB drive, although if you ever required extra space, or wish to backup data, then the 4 supplied USB ports enable you to easily link up to an external hard drive. As mentioned, the processor has a bit more speed than the slightly cheaper SVE1512J6EW model - with an Intel i5 2.5GHZ processor instead of the Intel Core i3 2.4GHz, and as a result costs approximately £60 extra. Both laptops feature the same 4GB RAM, which keeps applications running smoothly and without issues. The display is pretty good, as you'd expect from a TV and electronics manufacturer such as Sony, all of our testers liked the picture - no complaints here whatsoever. Sound quality was very good, as we've come to expect from Sony - if you plan on using this laptop in public you may still wish to invest in headphones - however for general listening, we couldn't fault the audio. So why should you buy this laptop? Pros: Very fast, looks good, plenty of connectivity options. Cons: The white finish may mark with long term use. Asides from that, no real issues. A great laptop - it's features a processor upgrade on the marginally cheaper SVE1512J6EW model - which if you're already spending over £400 on a laptop, it may be worth stretching that extra £60 to get the benefits of the faster processor.